In 1912 John Davidson, Provincial Botanist, established western Canada’s first botanical garden and arboretum on the Essondale grounds. 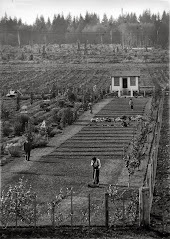 Davidson would move the garden to the new UBC campus in 1916, but the arboretum remains to this day. Edward "Ed" Bence Stinchcombe,(d.Sept 9,1929,Vancouver,63yrs.) was overseer of grounds & works from 1903 until several months before his death in 1929. John "Jack" Renton replaced him. Ed was responsible for most of the early plantings. 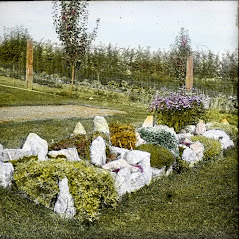 British Columbia botanical study underwent a significant generational change between 1910 and 1925. We can learn about this shift by examining the competing aspirations of James Robert Anderson of Victoria and John Davidson of Vancouver. This BEN entry will trace some of the conflicts that ensued as each man attempted to build and maintain an herbarium in a province that was not inclined to support even one such institution. Neither man held a university degree, but the B.C. government considered Davidson to be their botanical expert possessing greater authority than Anderson, who had made the study of British Columbia flora a life-long passion. This competition represented some of the first steps in the professionalization of BC nature study and epitomized the traditional political rivalry between Vancouver Island and the Bitish Columbia mainland. James Robert Anderson (1841-1930) was born on June 19 at Fort Nisqually, then located in the Hudson's Bay Company commercial empire. The young Anderson, one of thirteen children, was "the almost constant companion of his father," Alexander Caulfield Anderson (1814-1884). Anderson senior was the Hudson Bay Company employee in charge of the fort. Later the family moved to Victoria and miscellaneous diary entries beginning in 1879 indicate that James Robert was active in collecting botanical specimens as a diversion from his business pursuits. He became an accountant in the "Government Buildings" and was later appointed the "Collector of Statistics" for Agriculture in June 1891. The Department of Agriculture was initiated to advise BC's immigrant farmers on which crops were best suited to which regions of the province. Scientific agricultural advice was to help overcome the lack of arable land in B.C., as assumptions of agrarianism pervaded government policy through to the 1920s. Science was thus a tool for economic development, and in his first Departmental report Anderson described topics that ranged quite broadly to include climate, the specific crops being grown in various districts, the hindrances to each such as diseases, and animal pests. "During my tenure of office, I voluntarily added to my duties the collection and classification of the botany of the province, which, when I left, amounted to some thousands of specimens... I may add that I voluntarily did this work, it being no part of my duties, and spent most of my holidays and spare time towards its accomplishment with the view of ultimately building up a Botanical Department for the Provincial Museum in Victoria." Anderson joined the Natural History Society of British Columbia in 1895, and he had far more success collecting herbarium specimens than the agricultural statistics that were the original purpose of his job. His title eventually changed from Statistician to Deputy Minister of Agriculture, a re-naming that accurately reflected his increased activities. When the 67-year-old Anderson contracted severe pneumonia, the Minister forced his retirement on September 8th, 1908. Retirement meant an opportunity for Anderson to concentrate on the portions of his job that he loved the most those botanical activities that he had voluntarily added to his duties. In the process the government became possessive of Anderson's herbarium, still housed in the government buildings, and was reluctant to transfer it to the Provincial Museum. Cabinet declined Anderson' s offer to maintain the herbarium for a modest pension and they began to limit his access to the specimens that he had collected as a volunteer. Even more insulting was the rumour that "a stranger" had been employed by the government to work up a herbarium representative of the B.C. flora, a project that Anderson had claimed as his own life's work. 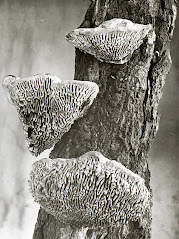 At the request of the Natural History Society, in February 1909 Anderson undertook to compile a work on the flora of B.C. for a fee of $100. He submitted a complete manuscript in March 1910, but there was no money to publish and distribute it. Anderson submitted his draft manuscript to the provincial secretary, Henry Esson Young, for evaluation and possible publication as a government document. Anderson was explicit in his instructions that "whatever is decided I am averse to my paper being subjected to the criticism of any one less acquainted with the subject than I am." Through a friend in Vancouver, Anderson learned that his manuscript had been handed to John Davidson for evaluation, the same "stranger" who had been recently employed as Provincial Botanist to produce a B.C. flora; worse still in Anderson's mind was the fact that Davidson was "now preparing a paper [of his own] of those subjects." The minister responded that he had "taken the matter up with my expert, Mr. Davidson, of the Botanical Department," who deplored the inactivity of the Vancouver and Victoria Natural History Societies. Davidson had counselled Young that Anderson's paper was exactly the sort of publication that should come out of the amateur society and that there should not be any need for its publication by the government. This advice was one of several events that soured the relationship between the natural history societies on Vancouver Island and the mainland. Anderson's piece was eventually published, by the Department of Education in 1925, under the title Trees and Shrubs, Food, Medicinal and Poisonous Plants of British Columbia. Anderson died in Victoria five years later, having achieved success as a collector but never attaining much recognition for his efforts. Who was this mysterious "stranger" in Vancouver? John Davidson (1878-1970) had worked in the Botany Museum at the University of Aberdeen, Scotland from 1893 to 1911. 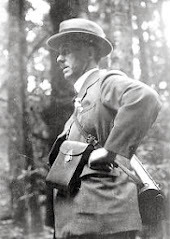 He emigrated to Vancouver in 1911, at which time Henry Esson Young, Provincial Secretary, appointed him to assist G.K. MacLean in conducting a botanical survey of B.C. 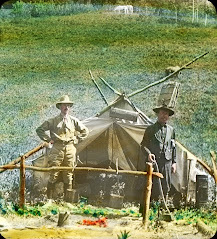 Conflict between MacLean and Davidson regarding their mandate prompted Young to re-appoint MacLean elsewhere, and Davidson became British Columbia's Provincial Botanist. Young was also in charge of the Ministries of Education and Health, so in anticipation of the future University of British Columbia, Davidson immediately began work on a provincial herbarium and a botanical garden. Davidson's botanical garden was located at Essondale on the grounds of the provincial mental hospital (courtesy of the minister). This was an enormous opportunity, but one that left many questions as Davidson did not know how long it would be until the work of the Botanical Office would be transferred to the University. Young had not made it clear whether he intended for the Office to continue after a University Botanical Department had been established, or whether the latter would absorb the former. One of Davidson's first tasks was to examine Anderson's collection, which he described as representing "much field work enthusiastically pursued." Davidson considered it "splendid" and said that it "would have formed a very good nucleus for a Provincial Herbarium were it organized by species rather than alphabetically." Davidson's initial collecting activities put him in direct competition with J.R. Anderson's retirement project in Victoria. Davidson thought of himself as a botanical pioneer and downplayed his lack of a degree, doing his utmost to differentiate himself from self-taught locals such as Anderson. Anderson saw himself as having a lifetime of local botanical experience and Davidson as knowing a great deal about taxonomy, but little of the local flora. For the next five years Davidson worked hard botanizing around Vancouver, his priority to record the names and locations of plants so that in future years researchers could tell which species were native and which were due to "man's interference with nature's order of things." Through this work he met and then collaborated with members of the B.C. Alpine Club, to whom he gave night classes in natural history. In the spring of 1914, Minister Young asked Davidson to apply for a position in the soon to be created provincial university, something that pleased the 35-year-old botanist to no end. University president Frank F. Wesbrook was not so impressed by Davidson's qualifications however, and he wrote that Davidson's training appear to be rather along the lines of collecting, classifying and preserving plants for museum purposes rather than the conduct of a large botanical department, of which the museum would be but a single feature and sub-department. Wesbrook felt that the post of a junior in the botany department, such as that which Davidson sought, should wait until "after the appointment of the professor." The Botanical Office suffered a great blow when Henry Esson Young was replaced as Minister of Education by Thomas Taylor on December 15, 1915. Without the protection of his former patron, Davidson's office and activities were threatened with abolition " on the ground of economy" due to the war that was then raging in Europe. Davidson was instructed to cease operations on March 31, 1916, at which time he was to dismiss his staff and hand over all of the specimens to the University of British Columbia. Davidson had cultivated supportive networks in every social stratum and sympathetic letters to the editor appeared in the Vancouver newspapers. What troubled Davidson however, was that the Vancouver Island natural historians, so closely associated with the Provincial Natural History Museum, remained mute while many others came to his aid. In his greatest hour of need since arriving in B.C., Davidson's previous activities and outlook had served to alienate those whose aspirations were strikingly similar to his own. Correspondence between naturalists on the mainland and those on the island explain the problem. Charles Frederick Newcombe (1851 -1924) wrote that he had initially cooperated with Davidson in sending collections of specimens, but that he did not see Davidson's office as in any way necessary. This was because John Macoun (1831-1920), formerly the natural historian with the federal Geological Survey, had retired to the Island in Sidney, and he was always ready to assist local amateurs in identifying material. Newcombe recognized Davidson's "practical training" and had tried unsuccessfully to get him to "do something to help our Victoria collections." Davidson was "standoffish" in response to this request, which ended potential botanical cooperation across the Strait of Georgia. "Mr. Davidson's evident wish to run his office as a 'One man show' has alienated many would-be supporters, and his present 'S.O.S.' call meets with less sympathy than it would otherwise have done." Rather than cooperating with other botanists in publishing a tentative list of B.C. plant distributions for others to improve upon, Davidson kept this information in a card file in the Botanical Office. This increased his authority as an expert but at the cost of support and contributions from others equally qualified. As the issue of the Botanical Office closure was debated in the editorial pages, a compromise emerged in March 1916 that Davidson and his staff should accompany the collections and continue their work at the University of British Columbia. Davidson moved what plants and shrubs that he could to Point Grey, but by then the trees were too well established so they remained behind at the Essondale site (where they still stand, now called Riverview). After a successful teaching career at UBC, Davidson would eventually retire in 1948. Within a few years the space occupied by his botanical garden was claimed for building construction and parking lots. 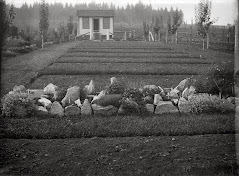 A new botanical garden was established at a different UBC location in 1968. The UBC native plant garden is dedicated to Davidson's memory and countless Davidson sheets are still held in the UBC Herbarium. Both Anderson and Davidson represent a time in which it was possible to become a self-taught botanical authority. They acquired their expertise through direct observation, assisted by natural history museums and amateur societies. Over the course of their lifetimes these institutions were being eclipsed by research universities as the primary centres of learning. John Davidson, being younger and located near the newly created UBC, was able to navigate this shifting terrain. James Robert Anderson was already too old to accommodate these institutional changes so his botanical legacy, equally impressive, is less well appreciated today. Some old down-loadable books, about botany and Agriculture. Botany John, was building on others before him. An excerpt from a book about British Columbia, where "Botany John" provided an article entitled "The botanical aspect of the Province"
Application for professor of Botany "Our Portrait" - reprinted from "Transactions of Aberdeen Working Men's Natural History and Scientific Society" Botany notes 1912-3 List of his Publications 1912-1957 Flora of British Columbia (1930) talks about the Essondale Botanical Garden. Trees of British Columbia (1918 rev.1926) classification and analytical tables. Plants by the Indian trail (1941) transcript of a radio talk show. Riverview blog used to report the latest news and issues surrounding the site. A click-able MAP of the Riverview Hospital grounds, which links to lots of information about the site and its buildings. Colony Farm Blog, now a Metro Vancouver Park.